The improvements that the YHA spent have helped to enhance the hostel. Re-purposed after nearly 100 years as a school for choirboys, this remarkable building boasts the ultimate location for exploring one of London's most fascinating tourist attractions - it's literally seconds from St Paul’s cathedral. Steeped in history, this hostel includes old-school choirboy graffiti (in a wood-panelled classroom no less), atmospheric spiral staircases and an elaborate exterior. And of course, there's nothing quite like waking up to those cathedral bells. The hostel’s central location is also great for exploring London on foot, with many of London's famous attractions close by. 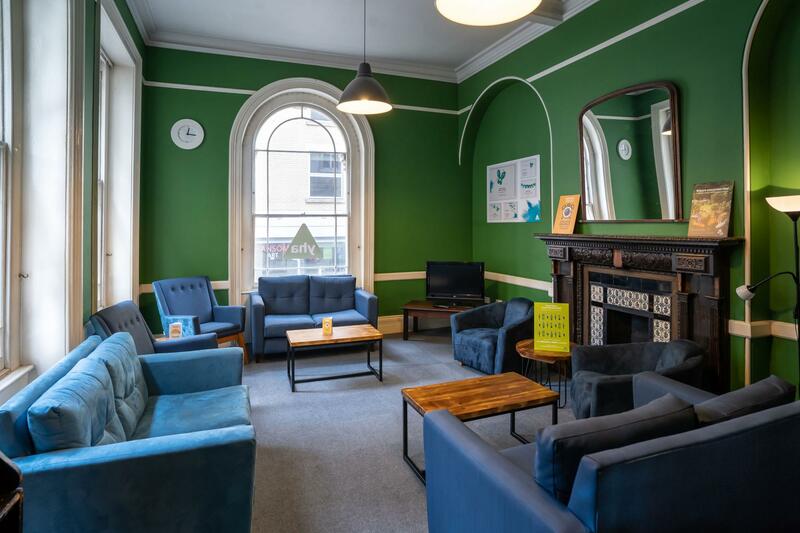 YHA London St Paul's has 213 beds across 5 x single rooms, 6 x double/twin rooms 8 x 3 bedded rooms, 9 x 4 bed rooms, 8 x 5 bed rooms, 6 x 6 bed rooms, 1 x 7 bed room, 4 x 8 bed rooms, 1 x 10 bed room and 1 x 11 bed room. If the charm of the cathedral bells disturb you, please ask our reception team for a complimentary pair of earplugs to ensure you enjoy a peaceful night's sleep. There is a seating area in reception as well as lots of information about London and a shop selling snacks and drinks. There is also a TV lounge with comfortable seating and a library of books which have all been donated to the hostel. Our large dining area is perfect for evening meals and breakfasts, and we have a laundry room available for washing and drying clothes. Please note that we have no self-catering facilities at this hostel. Energise your outdoor adventure with a nutritious packed picnic lunch. Prepared for you on request, our delicious packed lunches include a sandwich with a selection of fillings to choose from, a yummy cake, a bottle of still mineral water, a packet of crisps and a piece of fresh fruit. Parking: There is no parking at the hostel. YHA London St Paul's is in a grade 2 listed building in the City Of London and the former St Paul's Cathedral choir boys school. It is clad in London's signature Portland Stone (quarried from the Isle of Portland, off Dorset's coast) and displays some beautiful sgraffito elevations. The school and building are steeped in a tumultuous history: the original Choir School dates back to the early 1100s, but was destroyed by the Great Fire of London in 1666. It had several reincarnations, and this was the fourth. The building was designed with English Baroque style architecture in mind, following Sir Christopher Wren's vision and love for Baroque aesthetics. The Choir School moved premises in the 1960s because the building was under threat of demolition from a road-widening scheme but, fortunately, rather than being demolished, it was instead converted into a Youth Hostel. Having worked for YHA for over five years, I can honestly say this is the most enjoyable job I have had. The chance to meet people from all over the world who have all sorts of stories to tell, from backpackers to life members and my favourite - the school groups. Sometimes it can be the school childrens' first time away from home, and we can make their visit a memorable one. Manager recommends: A visit to St Paul’s Cathedral is a must! It's just opposite our Youth Hostel, so you don't need to go far to witness one of London's most majestic buildings - a truly breathtaking piece of architecture.